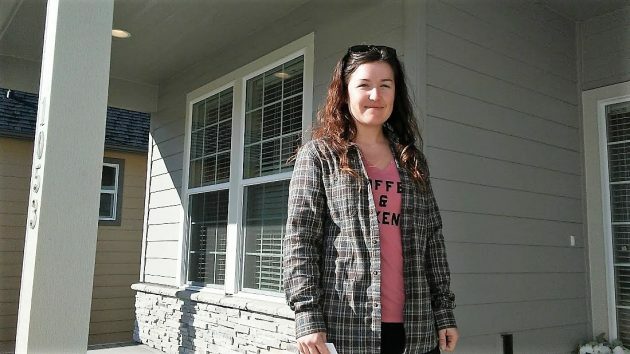 On Monday, Rainie Wheeler was just moving into the first of two riverfront houses to be built at Edgewater Village. Time for an update on Edgewater Village, the new neighborhood on Albany’s riverfront that’s on my favorite bike route. A moving truck attracted my attention Monday. It caught my eye because it was parked at one of the first two houses to be completed facing the riverfront and the Dave Clark Path. CARA, the downtown urban renewal district, had been particularly keen to have these houses constructed. When I stopped, I met Rainie Wheeler, who was renting the house to live there with her two young sons. Like its neighbor, the house has a 440-square-foot garage and 1,839 square feet of living space, with three bedrooms and two and a half baths. Wheeler is a logistics officer in the Oregon National Guard and works for the Guard in Salem. 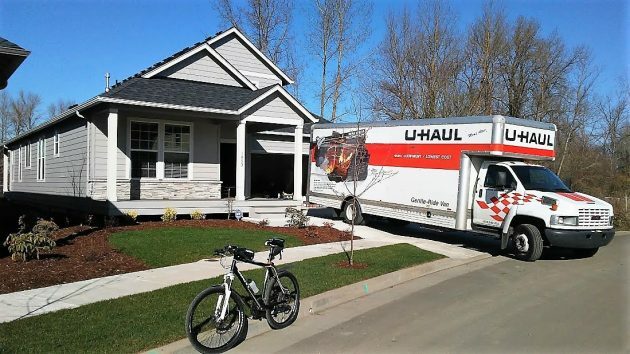 She has lived in Albany four or five years and, taking a brief break while instructing the movers, told me she is delighted with the location and the interior of her new home, and finds it’s a fairly easy commute to her job. Both the riverfront houses — same size but different interiors and priced in the “mid-high 300s” — were finished a few weeks ago. The other one remains for sale. CARA supported the Edgewater development with an initial investment of $2.4 million several years ago, and then a payment last year of $315,600 toward street improvements. (The latter represents the city’s share of street work along a vacant acre it owns in the development.) The initial investment was turned into a loan that is being forgiven in stages as houses are completed. Eleven houses, smaller than the latest two, had been completed earlier. Last fall, Albany-based Baldwin General Contracting Inc. advertised for subcontractors to bid on building 37 more, both attached and detached, with construction starting last November with site work. All together, the latest plans for Edgewater show 30 single-family homes (12 facing the river and 18 facing a street) and 28 townhomes (10 along the riverfront path and 18 facing inland). The moving truck is what made me stop on my Monday ride. You bet George, I’d be wildly happy to with CARA forgiving loans left-n-right. Don’t trip on your way to the bank to deposit “our” scalped tax dollars. Please show me a bank that would have given such generous loan conditions! $300,000 plus!!!! And, some of the money spent to make this Edgewater development happen came from CARA (the taxpayers of Albany, that is)!!!! Too rich for any retiree, except wealthy ones, and too rich for young people on minimum wage. Soon as I sign off, I will write another letter to the editor blasting CARA! I’m left wondering if someone wrote that for Mr. Diamond. I certainly would not characterize Albany as “progressive” or “incredibly progressive”. Nice looking home though. It is complete with a postage stamp front lawn. One could manage that with a simple, antique push mower. The kind without engine…electric or single cylinder.